Melissa Senate's novels are guaranteed to allow you to drift away to a romantic fantasy-world -- if only for a few hours at a time, and Questions to Ask Before Marrying is no exception. Women will easily relate to the plot because the Miller sisters face dilemmas we're curious to figure out ourselves! 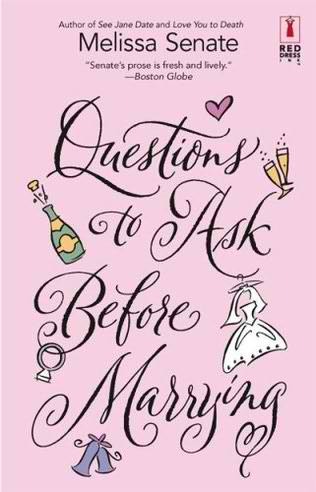 After all -- what IS the right choice when stuck between having to choose whether you should marry the man you can always rely on versus marrying the man who makes your heart race? In the most enjoyable way possible, Melissa Senate explores whether true love is as easy as fairy-tales make it out to be or attainable only through hard work. For what many consider to be part of the chick-lit genre, Questions to Ask Before Marrying is one of the best of its kind. It's not too cheesy or as unrealistic as other novels in the genre and satisfies your need for perfect reading entertainment. Other amazing novels by Melissa Senate I recommend are See Jane Date (2001), Whose Wedding is it Anyway? (2004) and The Breakup Club (2006).